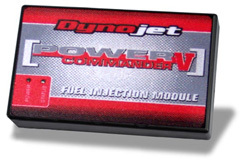 The Power Commander V 20-005 is supplied with a base map stored for the Suzuki GSX-R 600 2006-2010 in the microprocessor. This (base map) is typically a map that has been developed to provide an improvement for most combinations matching the map description (i.e. stock bike or performance exhaust and air filter).